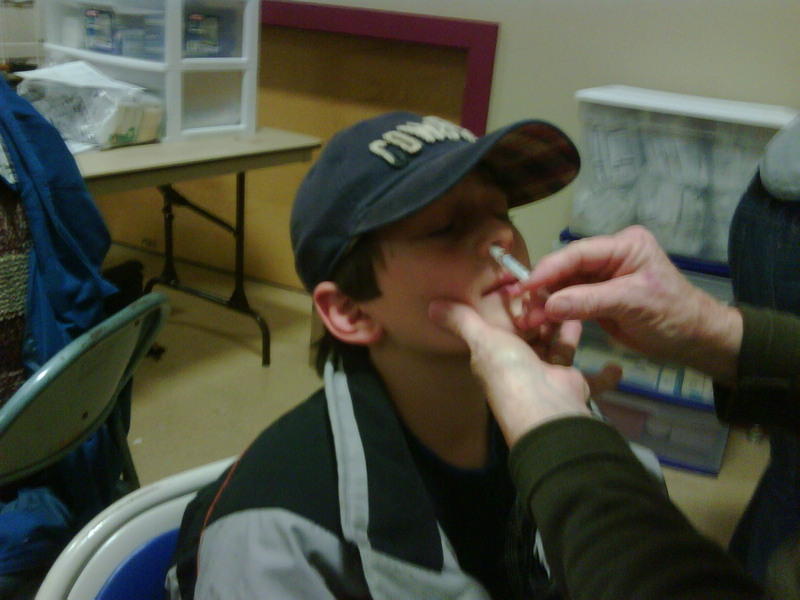 This past Friday night my children were both finally vaccinated against H1N1 at a vaccination clinic at our town hall. It’s hard to express the relief I felt the moment they inhaled those precious (and hard to find) vaccines. While I recognize that the vaccine takes several days (and two doses) to offer protection, I still let my guard down a bit and gave the ole hand sanitizer a welcome respite over the weekend. Until recently, we had no means of protecting ourselves and our loved ones against this virus aside from practicing the proper hand washing techniques and of course staying away from anyone who looked like they’d contracted the plague! Thankfully, shipments of the vaccine are increasing, and more of us can be protected each day. In fact, Google and the American Lung Association have joined forces on a newer version of a flu shot clinic locator that includes both seasonal and H1N1 vaccination sites. The site is easy to remember: www.google.com/flushot and I urge everyone not to give up on efforts to get vaccinated. My family is one of the lucky ones. We have two healthy, happy boys. One of whom is a nine year old who loves baseball, ice hockey and skiing. However, each time I hear on the news that another child is suffering or has passed away, I remember the ordeal we endured when he was just past his first birthday. During that flu season, he was hospitalized for “complications related to influenza” and it was a horrible experience for our family. At the urging of Families Fighting Flu, I put our experiences on paper in the hopes that it would serve as a reminder of how dangerous the flu can be. The first ten months of our son’s life progressed smoothly. He was a happy baby, always laughing. As fall arrived, he began catching numerous colds and did not seem to recover as quickly as other babies his age. Since he was not in daycare, his parents wondered why he contracted so many illnesses. His breathing would become labored and he would often vomit from the mucous build up in his nose and lungs. Just prior to his first birthday, he became very ill – he was unable to be consoled, had a very high fever, and was listless and vomiting. We were visiting my husband’s parents at the time, so we called our pediatrician who recommended that we take him directly to the emergency room. As soon as we arrived, my son was rushed into a treatment room and placed on oxygen as they assessed his condition. His breathing was extremely labored and he was excessively dehydrated from the fever and vomiting. He was admitted to the hospital and placed in a large, industrial type crib with metal bars. His arm had to be tied down so that the intravenous fluids he was being given to combat the dehydration could be placed in his little arm. He was surrounded by an oxygen tent to aid with his breathing, which precluded me from being able to breastfeed him on schedule and otherwise soothe him by holding him. Seeing a small baby in this condition is enough to break anyone’s heart, but as his parents, it was heart-wrenching. Fortunately, he responded well to the treatments and was able to go home after several days for close follow-up with his pediatrician. Our family enjoyed his first birthday celebration later in the month, thinking we were in the clear. However, several days later he became irritable once again and started having high fevers. Three days later, he was prescribed Albuterol to help with his breathing and the pediatrician kept a close watch on our son to ensure he did not develop pneumonia. In November, he was placed on allergy medicine because of the continued “phlegmy, harsh cough”. On November 17th, I became very concerned about his condition – throughout the day he continued to vomit and had a very high fever. As the night wore on, he seemed to become more listless, but as day broke, so did the fever. My husband was out of town so I called the pediatrician to say he felt cold and clammy, but still so very listless. The pediatrician directed me to rush the baby to the hospital. Once in the emergency room, he was again given oxygen and intravenous fluids. While in the ER, I learned that being cold and clammy was not a sign the fever had broken, but a dangerous sign that his blood pressure was too low. My husband rushed home from his trip as our son was admitted to the hospital for treatment. Again he was placed in the crib with the oxygen tent and every hour, twenty four hours a day a technician would come in to provide the baby with breathing treatments. Often we would offer to give the treatments, just so we could feel useful during the interminable days and nights. Three days later he was discharged to a very nervous set of parents with instructions about how to assess his breathing function in the event that he became ill again. Fortunately, he made it through the rest of the flu season without any major illnesses. Flash forward one year to the impeding influenza season. I placed a call to my pediatrician to inquire about his need for a flu shot. The staff person informed me there was a shortage and the vaccine was available only for high risk children. I mentioned that he was hospitalized twice last year and assumed he might be high risk. It wasn’t until this time that the staff informed me that, in fact he had been hospitalized due to complications from the flu and that since he also has asthma; he should receive the flu vaccine. This was the first time we learned that our son’s hospitalization was related to the flu. He’d only recently been diagnosed with asthma, which is a condition that is only diagnosed after a child exhibits ongoing symptoms. It is sometimes too late by the time you realize a child is high risk particularly since it may not be until the second year of life that asthma is even diagnosed; after several episodes. Fortunately, influenza vaccine is now recommended for all children beginning at six months of age. ALL children beginning at 6 months of age and their family members or caregivers should be vaccinated against influenza each year. Ask your doctors, other health care providers and your child’s teachers if they have received their flu shot.